To reap the full benefits of diversity and inclusion, today's forward thinking companies look past "diversity" training towards a more comprehensive, holistic business approach. These leaders incorporate diversity and inclusion into every aspect of business culture, employee engagement, talent management and market penetration. Trailblazers reveals the practices, metrics and research, as well as the anecdotal evidence, for building and sustaining workplace cultures that make strategic diversity and inclusion a business necessity. Focusing on concrete actions you can implement immediately, this insider guide profiles the best practices award-winning companies have used on a sustained basis to transform their organizations. 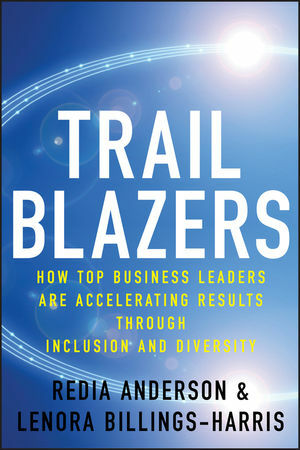 Trailblazers gives you an in-depth view from the inside out of which practical solutions make diversity and inclusion efforts a systemic and winning way of doing business for today's top-performing companies. REDIA ANDERSON, executive coach and nationally recognized leader in the field of inclusion and diversity, is a former chief diversity officer (Deloitte, Equiva Servicesjoint venture between Shell/Texaco/Saudi Aramco) and has worked with Fortune 500 corporations, partnerships, and universities. Redia is Managing Partner of Anderson People Strategies, LLC, where she helps organizations align people, performance, and results. Redia has been featured in national publications such as Working Mother and DiversityInc magazine. LENORA BILLINGS-HARRIS is a diversity strategist and international speaker who helps organizations make diversity a competitive advantage. Diversity Woman magazine named her as one of twenty top influential diversity leaders in 2008, and she is a past president of the National Speakers Association. Lenora serves on the adjunct faculties of the business schools of Averett University and the University of North Carolina at Greensboro.